Profitez-en et profitez d'un condo de plage vraiment fantastique. Bonjour voyageur! Merci de regarder notre unité, nous sommes ici pour vous aider avec la réservation de ce magnifique condo de plage. Nous nous engageons à fournir à nos clients un excellent service et un beau condo. Nous apprécions recevoir des demandes de renseignements, n'hésitez donc pas à nous contacter. Nous vous fournirons des devis et répondrons à toutes vos questions. Face au golfe, le balcon privé s'ouvre sur la chambre principale et le salon donnant directement sur la plage. Ceci est une belle unité de deux chambres qui est située sur l'île d'Okaloosa, l'île de la barrière séparant Fort Walton Beach et Destin. C'est la meilleure destination de vacances pour la famille, le golfeur, le shopping ou le pêcheur. Il n'y a pas de hauts immeubles en vue, car rien sur 7 étages n'est autorisé sur l'île d'Okaloosa. Parce que ce bâtiment ne compte que 68 unités et qu'il y a beaucoup de front de mer, les plages de sable blanc et les eaux turquoises du Golfe ne sont jamais bondées, ce qui en fait un paradis! Beaucoup de gens disent que ce sont les plus belles plages qu'ils aient jamais vues. La télévision, les sondages et les magazines classent la Côte d’Emeraude parmi les dix meilleures villes du monde pour ses eaux joliment colorées et son sable blanc comme neige. Vous pouvez vous détendre avec votre café du matin ou un dîner romantique sur votre privé et regarder les dauphins sauter à seulement quelques centaines de mètres! Vous avez une vue magnifique sur le golfe depuis la cuisine, le salon et la chambre principale. Cette unité dispose également d'une connexion Wi-Fi gratuite et d'une télévision dans chaque chambre. We enjoyed our stay in this particular unit very much. The balcony and the view were spectacular, the condo neat and clean and well-furnished, the grounds lovely and the included beach service in our reservation was a huge plus. Some advice for future travelers: the laundry is not in the room, it's pay machines on each floor. The 6th floor dryer was not working when we were there so we had to haul our wet stuff to another floor. The "heated" pool was pretty cold, but the kids didn't seem to mind too much. The complex as a whole is on the older side and, as such, I suspect that the quality varies widely from unit to unit. This one was just fine and it was relaxing to be able to hear the gulf all day and all night. A little more furniture stuffed into the condo than is my own personal taste, but still a great, relaxing experience and vacation. Debated between 4 & 5 stars and then realized I was only leaning toward 4 because of my own personal preferences - laundry in the room would have been ideal but I realize that might just not be the standard here so no big deal. I also tend to personally prefer a smaller building/complex overall, but that's not the fault of this unit. This was our second year staying at this condo and we plan to come back again. The unit is spacious, clean and comfortable. We love the quiet beach at the end of the island. 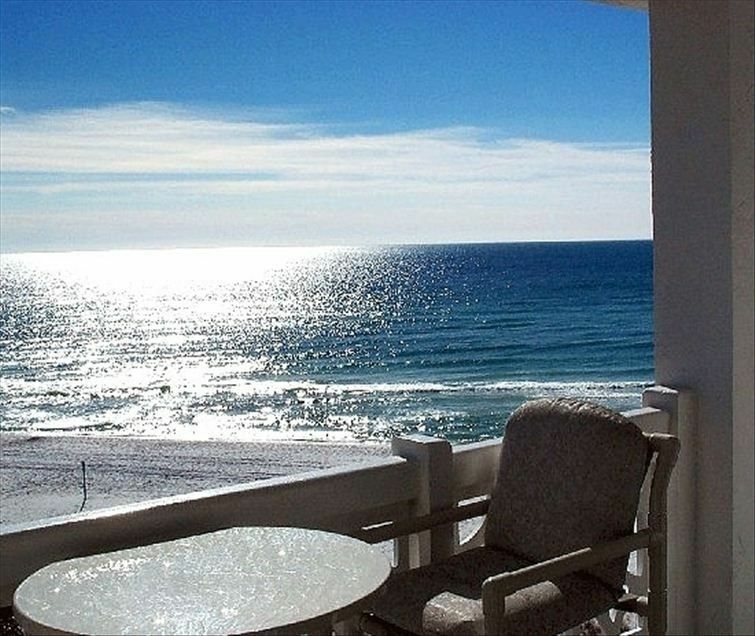 It was an awesome condo with great views of the beach, sunrise, sunsets, and beaches. Beautiful beaches. Water, sunrise and sunset. The condo was beautifully decorated and comfortable. i appreciate your nice comments about our condo, and I am so pleased you enjoyed your stay. We would love for you to come back. This condo has great views and very convenient access to the beach. We really did like the place but I would say whomever they hire to clean the condo should have a chat with them. It was extremely dusty and had a bit of stale smell. I realize its a vacation home but with this in mind perhaps a bit of a furniture update would not hurt either. Also not sure about all the mirrors in the condo. We loved this unit! The views were great, the unit had everything we needed and the unit was very clean. The pool and the property are well maintained. The beach was beautiful and it was very quiet with the complex at the end of the beach. We look forward to coming back! We have stayed at The El Matador for 16 years in a row. We were actually married in front of the Matador on the white Sandy beach. This is one of the nicer units, and is the reason for the 4 star rating. It saddens me that the property is starting to decline. The maintenance standards are not what they once were. Only 1 poorly operating elevator as the other one was not operating the entire week. Luggage carts rusting and falling apart. Tiles busted around the pool. Pool needs some attention even simple things like cleaning would be an improvement. None of these issues are directly related with the unit, so glad to provide the owner/management with a positive review. Unfortunately, we are looking for a new location moving forward for our annual trip due only to the decline of the property and facilities not the unit we stayed in.